What's a Fawn-footed Melomys? It's a long name for a cute kind of rodent, that's featured on this coloring page! This lesser bilby looks like he's up to something! 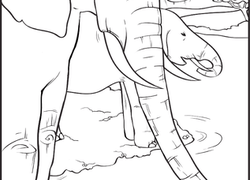 Find out about this extinct animal and give him some colour. This electric eel coloring page is perfect for kids who favor slimy and scaly over soft and fluffy. Have you heard of Himalayan-Persian cats? This fluffy cat is known for its white hair with brown tips and super blue eyes, but colour this one however you like! 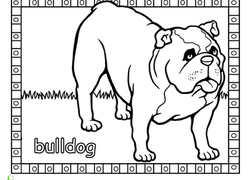 If your child is a dog-lover, he's sure to enjoy coloring in this cute bulldog, and he'll even get some letter learning at the same time. Introduce your child to a new dog breed: the German shepherd! She'll get to colour this cutie in, and read a fun fact about German shepherds as well. Learn a new species of bird with a fun info sheet! Your child will get to read some fun facts about the Sharp Shinned Hawk, and complete a crossword. The Long-tailed Macaque on this coloring page looks pretty patient; like he might sit still for your child to colour him in. A coloring page of geckos for year 2 science or art classes. Doug the Bug has a lot of jobs... but today he is king! Help your little artist add some bright colors to his royal costume. Learn about the numbat, a squirrel-like creature from the Australian outback. Let your 1st grader jam out to this rockin' coloring sheet of the coolest sloth known to man as he wails on his guitar! These adorable opossums need some colors! Get together with your little one and colour this mother opposum as she gives her babies a ride through the treetops. What's a bullseye anyway? Introduce kids to figurative language with these fun coloring sheets featuring literal depictions of common animal idioms. Enjoy a cute Cockatiel coloring page with your child! He'll be learning a new sight word, as well as the species name in Latin. This koala coloring page features a cheerful little guy climbing a eucalyptus tree. Any budding bird-watcher will love adding some brilliant reds and oranges to these cardinals and the berry bushes they live in! This guy looks like an antelope, but his name is a lot more fun to say! Colour a pair of elephants enjoying cool drink at the watering hole. Coloring sheets are great for exposing your child to new animals. Meet the bilby, a sneaky-looking creature that sleeps during the day and feeds at night. Colour some beautiful Mute Swans with this coloring page! Your child will learn to write their species name in English and in Latin. 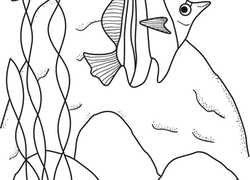 Teach your child about the Moorish Idol with this fun, under-the-sea coloring page. Fun and exciting coloring page of hungry hippos for kids to colour in! 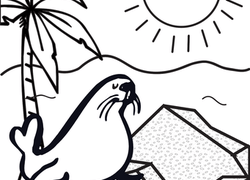 This kindergarten coloring page features a slippery seal basking in the sun.